There are two character’s I’ve been putting off drawing for a while, Ulf and Vígdís. 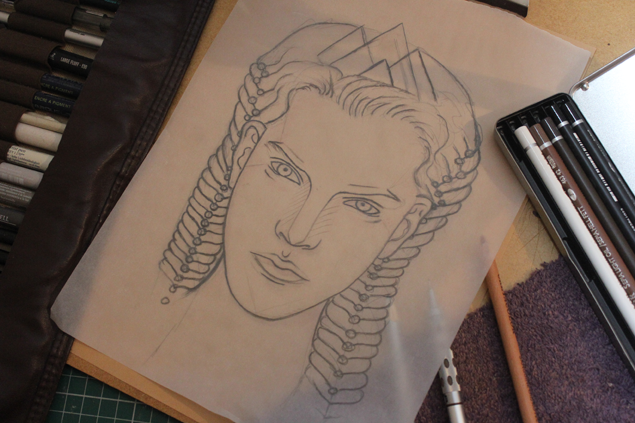 Ulf because I was dreading drawing all the cuffs in his hair, and Vígdís because each time I tried to draw her, I couldn’t quite get the right brow bones and nose for her. She needed to look like a woman with strong, almost harsh face. 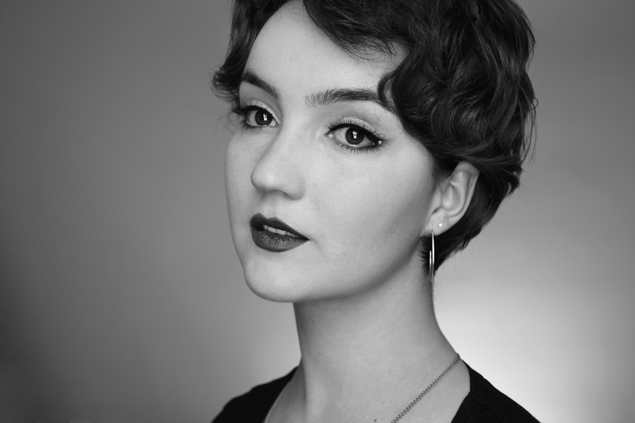 The kind of beauty that commands attention. I finally managed to get a sketch of her that I was happy with, originally I had planned to give her two thick braids on either side of her head, but I thought that fishtail braids would be a nice change. Especially if I had some pearls woven through them. 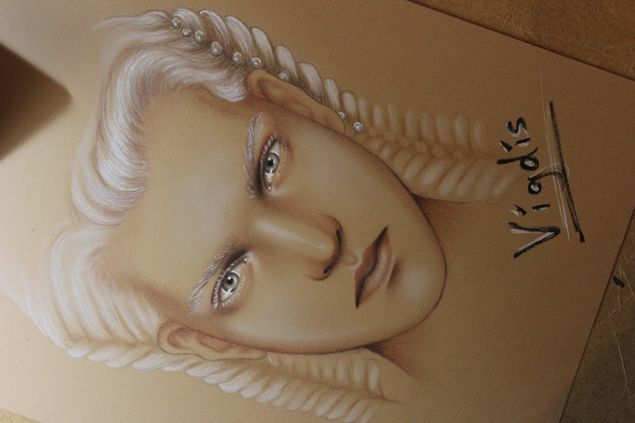 With Vígdís it’s also the first time I’ve drawn platinum blond hair before, so I was quite excited to try and layer up a mixture of white pan pastels, grey, white and light brown polychromo pencils and my good old white gel pen. 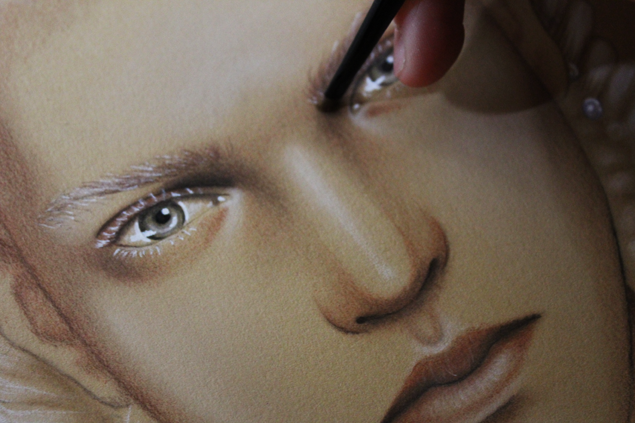 I started off with my Cretacolour pencils to start the shading on the face, and then blended it out with a small angled paintbrush I’d cut down to the roots so that it was stiff enough to firmly blend out the pencil. 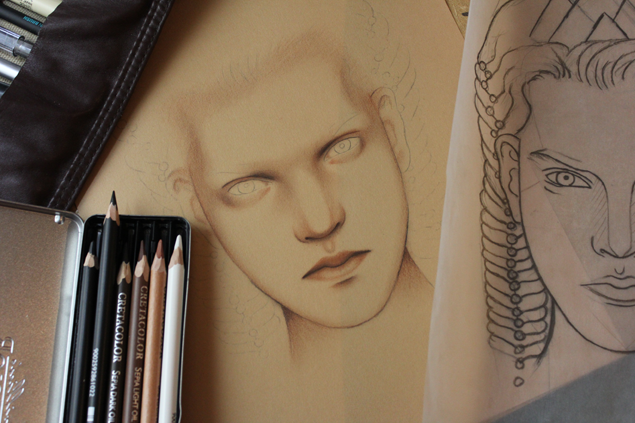 For shading, I’ve also added two disposable eyeliner brushes to my brush roll – one for dark colours and one for light. 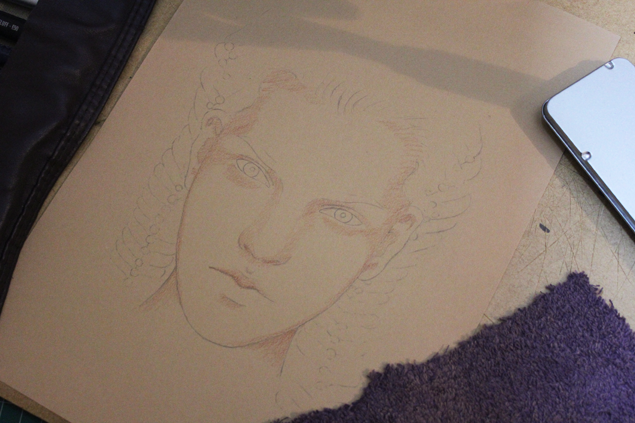 They’re absolutely amazing for blending out the small areas of a drawing, like the corner of the mouth or the eyes. I especially like them for adding the shading under the upper eyelid and blending out the iris colours. 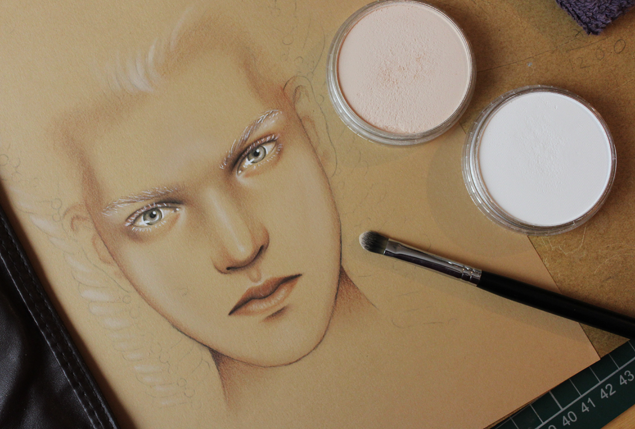 Of course for highlighting the skin I used my pan pastels and a few old makeup brushes. I normally avoid using the pure white colour for the skin, it tends to be way too harsh, but it was perfect today for the hair. I started by applying the white as an outline/base colour for the hair, then I went over it with pencils and then a white gel pencil to accentuate the white highlights. For the moment I’m going to leave the drawing like this. I still need to finish the pearls and the crown, the crown especially keeps giving me issues and I don’t want to draw it until I’m absolutely sure how it’s going to look. 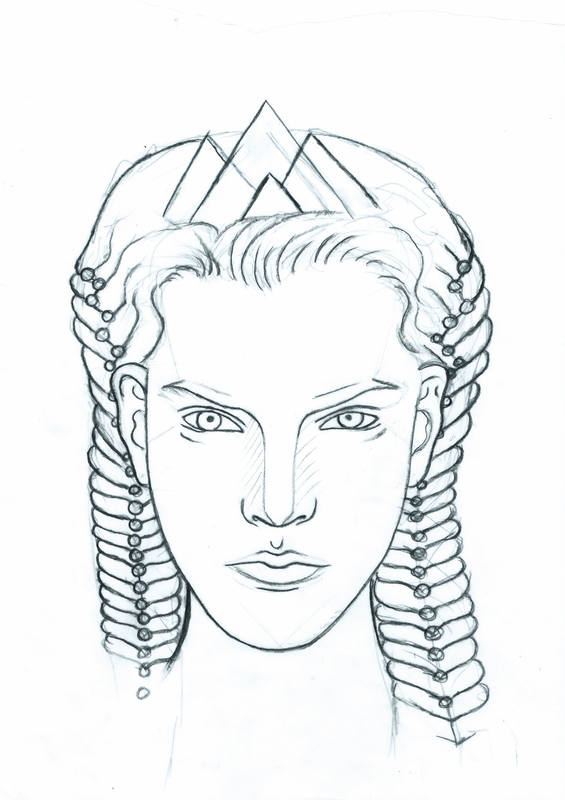 I’m torn between having a heavier more byzantine looking crown, or something light and delicate with small gems on it. All I’m sure of is that I want to have it made with the three triangles/mountains incorporated in the design, since they represent the three kingdoms of the dwarves (one of the kingdoms is long since destroyed in the Rojóða wars). The symbol of sovereignty over all the dwarf lands has to be there. One of you asked on one of my twitch live streams a few weeks if I would give away the original trace sketches away for people to colour in if they wanted to, so today I thought I would try that. If it’s something most of you like, I’ll try to keep doing it for all the new portraits.